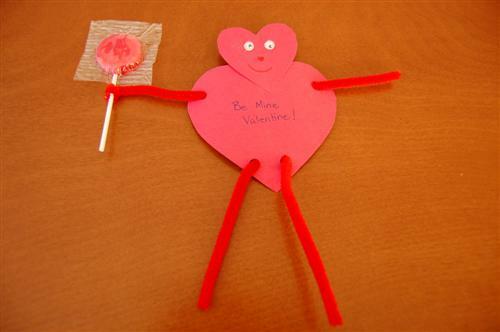 This is a fun way to make a special valentine or invitations to a Valentine's Day party. Cut two hearts. One apprximately 3" wide, the other 1 1/2" wide. Glue the bottom of the small heart to the top of the large heart. 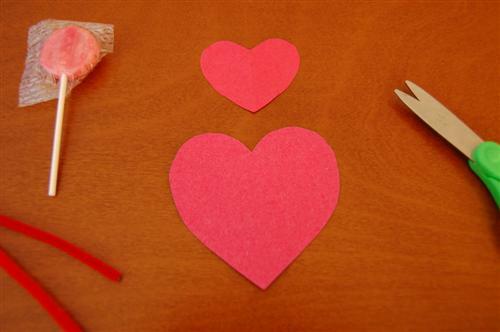 Use the hole punch to make holes in the upper sides and on either side of the bottom of the large heart. Fit one pipe cleaner through the two upper hole for arms. 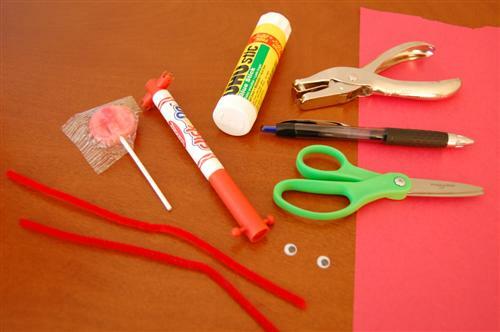 Fit the other pipe cleaner through the lower holes for legs. Wrap the end of one arm around the lollipop. Write a special message on the body. You could also make a smaller heart with a hole punched in it to hold a message in the other hand. Finish with facial features or other decorations.